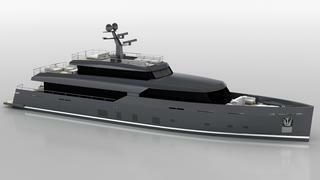 Italian builder Logica Yachts has extended its lineup with the introduction of a new Logica 135 superyacht, penned by Brenta Design. The Logica 135 is the middle child of the Logica fleet, coming in just behind the rule-breaking superyacht Logica 147, launched last year, and its kid sister the Logica 120, the yard’s smallest yacht that packs in big features. Logica Yachts aims to extend its offerings in the mid-range yacht market with the Logica 135, which shares the clean exterior styling of its predecessors. Like the Logica 147, design comes from Milan-based Brenta Design, whose experience in sailing yacht design is apparent on the slim, sleek exterior lines and excellent use of interior space. The main saloon and upper deck skylounge are complemented by three decks for outdoor living. 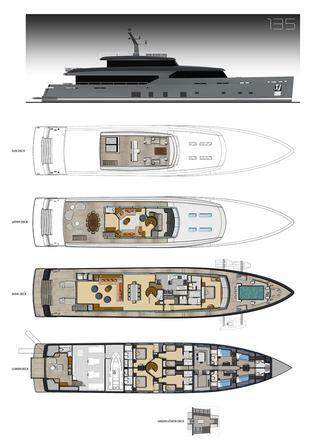 Naval architecture comes from PLANA Design, who have put a priority on sea keeping and low fuel consumption. The Logica 135 has a high cruising range for a yacht of her size; 3,000 nautical miles at a cruising speed of 14 knots and a whopping 9,000nm range at an economical cruise of 6.2 knots. Power options include twin MTU 12V 2000 M72 or twin MAN D 2862 LE 463 engines, with a max speed of 16.3 knots achieved. The Logica 135 will boast a spacious and well-lit master suite, situated forward on the main deck, which is steps away from the in-deck bow swimming pool. There is also stowage in the bow for a 4.3 metre crew tender and two Jet Skis, while a side garage will stow the 6.3 metre guest tender. Further guest accommodations of two VIP staterooms and two guest cabins are found belowdecks, and a crew of seven are accommodated as well. 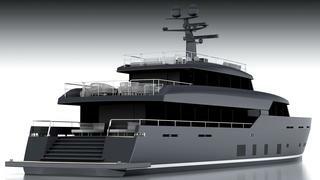 The yacht will be built at the Logica Yachts shipyard in Viareggio, Italy.